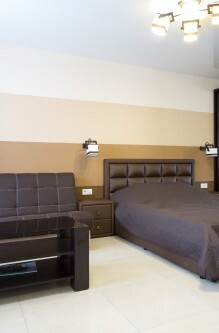 Nice and clean apartment in the city center of Kharkov. 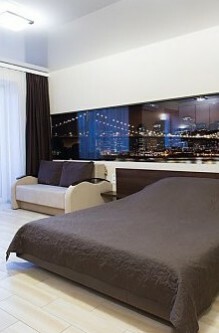 A newly renovated apartment, extra clean, completely furnished ,excellent interior, modern west domestic equipment, cold hot water (24 hrs a day), king size bed, big sofa, secure entrance door with intercom + own key, central water heating + backup electric heating system, modern bath, washing machine, iron and ironing-board, satellite TV, Dvd. 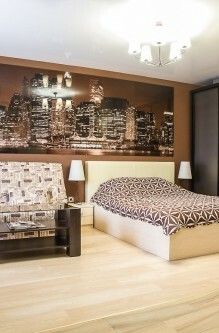 The apartment is located in the center of the city. Sleeping places: 2 (2 + 2) the Double bed, a double folding sofa. There is safe entrance door at an entrance on a coded lock, metal door in apartment. Big sleeping bed, Displayed big double sofa TV, Cable TV (over 100 channels) Hot water round 24 hours (boiler) Refrigerator, a microwave, an electric teapot; a toaster. Washing machine. The hair dryer, ironing table and ironing machine. This apartment is well appointed and functional, with good quality and newer furnishings to ensure a pleasant stay in the center of the city (10 minutes from main square). Coach can be transferred into an additional sleeping place. Gas hot water system and independent heating system, local phone number, air conditioner, TV, DVD, CD's/type recorder , shower cabin, ironing set, fridge, stove, and so on. Apartment is for 1-2 persons.